April may bring may flowers, but with those flowers comes allergies! There is no big surprise that May is National Asthma and Allergy Awareness month! It is no wonder with the piles of pollen, scatterings of flower blossoms and other allergens everywhere we turn. The thing is, if you have severe allergies, you fight this battle all year round. My son has fought with allergies his entire life and it has been a learning experience to say the least. We have had breathing treatments, made our own cleaning products and practically kept him prisoner in his own home to avoid the allergens outside. Little did we know, there were just as many allergens in the house as there were out of it! If this sounds familiar, you may be surprised to see what allergens are lurking in practically every surface of your home. With household dust being filled with all sorts of nasty things, it makes sense to learn 1 in 5 people are suffering from allergies. Skin Cells: We can shed up top 40,000 skin cells per minute, which equals to about a bag of chips per week. Um…gross! When these cells slough off of our body, they float around the air in our homes and will land on just about every surface imaginable. Dust Mites: Did you know these little buggers are in the spider family and fill their bellies with your skin? What is worse is there is an average of 1,000 of them in each square meter of carpet in your home. If you think that is bad, what until I tell you up to 3 million of them are hanging out in your mattress! And just when you thought you could not be more grossed out, it is not the dust mites themselves that make you sneeze, but rather their droppings! Yuck! 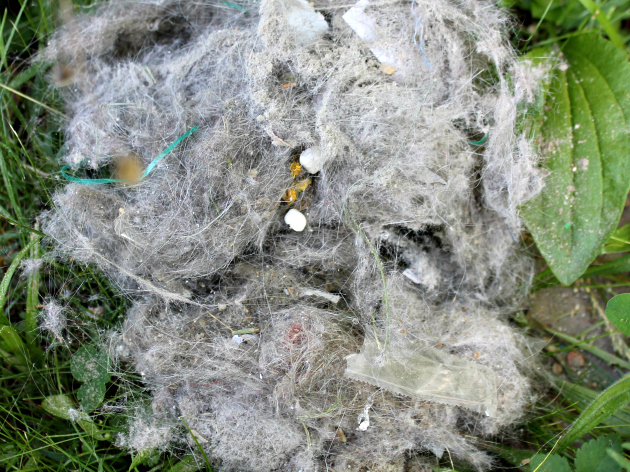 Pet hair: We have 2 cats, and although they are not long haired breeds, they shed a lot. We get their hair all over the sofa, the beds, our clothes and even on the bathroom rug, which is where Meep sleeps! Believe it or not, if you have dogs, you are not allergic to their hair but to their saliva! I did not know that, did you? With cats, we are allergic to their dander, which is the dead skin cells of your pet. Pollen: Although pollen is typically an outdoor allergen, it can find its way into your home every time you open a door and come in and out of your house. Usually the pollen will be found on your floors and on the surfaces closest to the doors which lead to the outside. Mold: Mold is a scary issue for our family because my husband and my son are deathly allergic. If they get near large amounts of mold, they can count on a trip to the ER. Mold grows in damp, enclosed areas were it is usually hard to clean. The spores from mold will make their way into the dust in your home and can cause those upper respiratory reactions that mimic a bad cold. 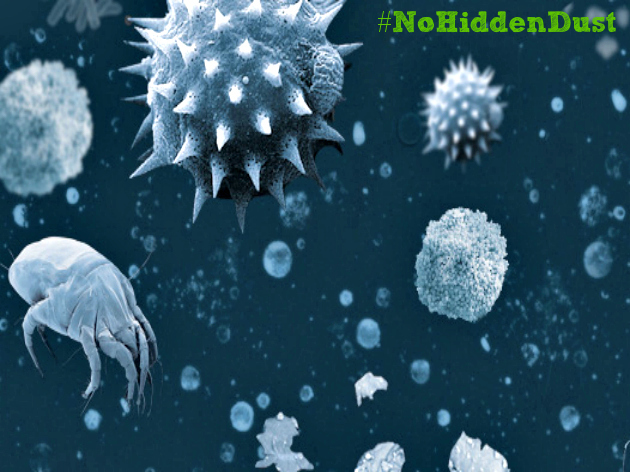 So, now that we know what the allergens in our home are and where they come from, the next step is to get rid of them. Even if you wipe your surfaces all day long, you are still only battling a fraction of the problem. Most of these allergens are on your carpets, floors, mattresses and other areas in your home. The single most brilliant item I have used in my home, is hands down, the Dyson DC65 Animal, which sells for $600. 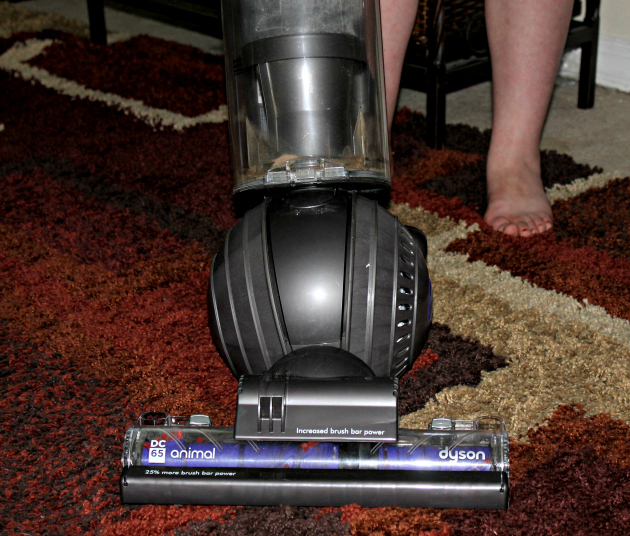 The Dyson DC 65 Animal is not just a vacuum people, but a lifesaver in our home! I have seen such a tremendous difference in Henry’s allergies in just the 10 days I have been using this incredible machine. The patented cyclone technology of the Dyson DC65, allows for the removal of over 99.97% of dust, dirt and other allergens in your home. Once you minimize the allergens, the air you breathe is lower in mold and bacteria, which leads to better breathing. One of the advantages the Dyson products have over other products is their HEPA filtration system. With other HEPA filters, the dust just swirls around and pathetically tries to clings to the filter, but much of the dust and dirt still gets out. With the Dyson HEPA system, the allergens, dirt and other nasties are captured with this magnificent machine and are completely sealed and contained. You see, Dyson has an in house microbiology lab where they grow and study these things and the allergens they produce. This allows the scientists to know these gross little guys inside and out and with that knowledge comes the power to defeat them. The Dyson vacuums are tested in many conditions to ensure you get a product which will withstand more than just the normal wear and tear. I am one of those people who has dropped a vacuum down a flight of stairs and was buying a new one. With the Dyson, I know it can take the abuse I can offer and still vacuum on carpet as well as hard floors for miles and miles. Here is a video to show you just how incredible this Dyson product is! I used the Dyson AFTER I vacuumed with my old model because I wanted to see just how good this baby was. I hope you are not grossed out with the picture of what I accumulated from just one vacuuming session in my 1,000 square foot house. Can you believe I got that much dirt and dust and allergens from just 15 minutes of vacuuming? After I emptied the amazingly easy to use Hygienic bin into the trash, I started on the mattresses and furniture. I wanted to be sure I used the DC65 Animal on as many surfaces in my home as I possibly could. 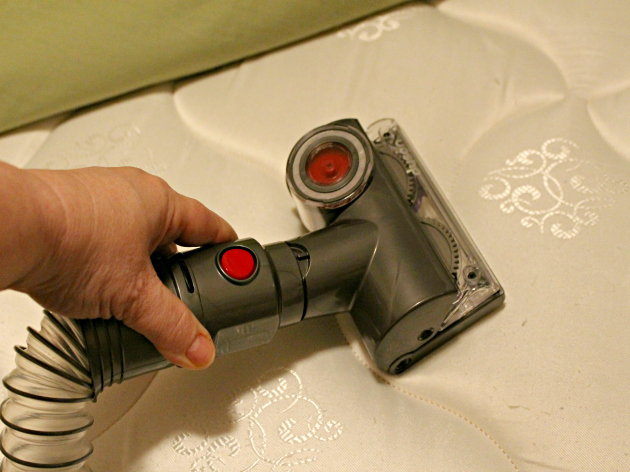 With all of the tools you get with the DC65 Animal, it makes it so much easier to reach around and under furniture, in the corners of the ceiling, the mattresses and anywhere else I could vacuum! I have had shoulder surgery and have a bad back, so managing a heavy vacuum is not easy to do. 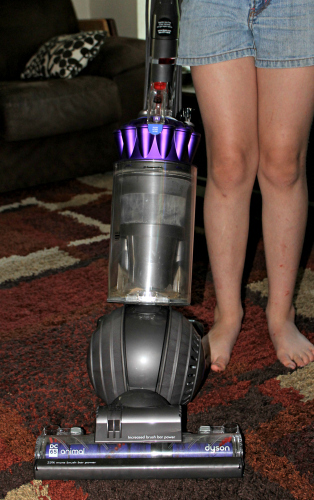 The Dyson DC65 Animal is I am so happy my family is breathing easier and I am sleeping easier knowing the Dyson DC65 Animal is keeping my house as allergen free as possible! Be sure to stay current with Dyson and follow them on Twitter, Pinterest and YouTube.